One of my Mom's favorite florists on Oahu is Flowers by Jr. Lou and T. Through the years I have seen my Mom purchase and give roses from them to celebrate many special occasions. My Mom loves flowers but hasn't been there for years because she no longer drives that far from her home. So today as I passed by this florist, I stopped to buy flowers for a very special occasion. You see, today is my parent's 64th Wedding Anniversary. I don't like spray paint on flowers but they had some really unique roses there that were blue but had not been spray painted. They even had some rainbow colored ones that were interesting. The kind lady who waited on me said that the person who grows them has a special technique to color them this way. I chose a blue bouquet because blue is my Mom's favorite color. It was these blue flowers that inspired the anniversary card I made for my parents. This stamp set that the sentiment comes from is called "Happy Wishes" and is one that you can get for free during saleabration when you place a qualifying order. The solid heart and outline heart comes from the set "Sure Do Love You" which is a great set to purchase to make Valentine's cards for next month. 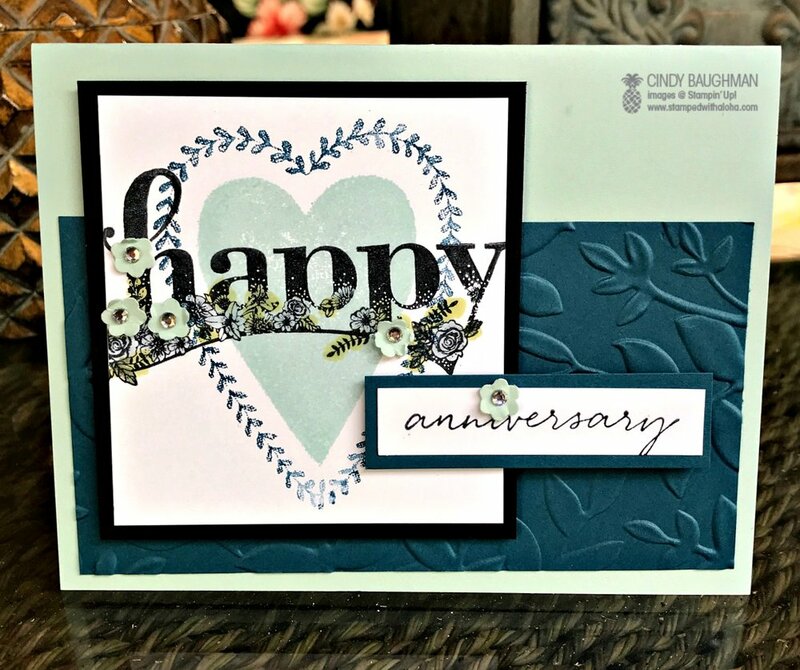 I used my favorite tree punch to create tiny blue flowers to embellish the front of this anniversary card and adorned each one with a jewel rhinestone. My parents have taught me so many valuable life lessons. When I had a dorm room fire in college and lost everything it was my Dad who told me that true value is not in things but only in our relationship with Christ which is eternal. Although my Dad no longer is able to tell his funny stories or offer words of wisdom he still teaches me about life in the way despite his health challenges he smiles. My Mom also just amazes me in the way she so lovingly cares for my Dad. It is such hard work and she is so strong. She has set such a great example to me in the way she selflessly cares for my Dad day in and day out. I am grateful to celebrate my parents on their anniversary today. They are truly an inspiration to me. Happy 64th Anniversary Dad and Mom! I sure do love you and am so grateful to God for blessing me with such amazing parents.